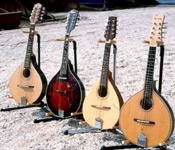 The mandolin is part of a family of instruments just like the violin family. The mandolin is the most common and is tuned like the fiddle, GDAE, its big brother, the mandola, is tuned like the viola, CGDA, and the octave mandola which has no violin equivalent is tuned GDAE. There are also the rarer mandocello (CGDA) and mandobass (EADG).